BEREA — Joe Haden has spent seven-plus seasons with the Browns, trailing only Joe Thomas in tenure. Haden’s days in Cleveland could be numbered. The Browns are “aggressively” trying to trade the cornerback, according to reports Tuesday, and the team did little to quiet the speculation. “This is the time of year where everything starts happening. 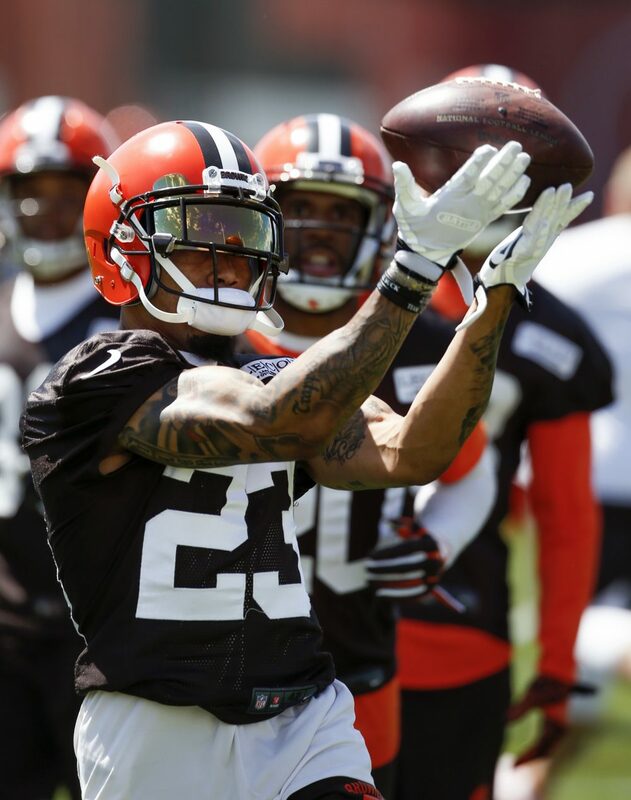 Things start getting said,” coach Hue Jackson said following practice in which Haden was a participant. The decision to move Haden will be made by executive vice president of football operations Sashi Brown. He likely concluded Haden, 28 and coming off two injury-plagued seasons, isn’t worth his $11.1 million salary for 2017. Haden, the No. 7 pick in 2010 and a Pro Bowler in 2013 and ’14, has worked with the starting defense throughout training camp and the preseason but some in the organization have questioned whether he’s one of the best two cornerbacks on the roster. Jamar Taylor and Jason McCourty, signed as a free agent in the offseason, would be the starters if Haden left. Briean Boddy-Calhoun would be the No. 3. Haden was not made available to the media, and agent Drew Rosenhaus declined comment via text message. Haden signed a five-year, $67.5 million extension in 2014 that runs through 2019. He’s due an $11.1 million salary this year and next and $10.4 million in 2019. He’s the seventh-highest-paid corner in the NFL and ranks second on the Browns behind backup quarterback Brock Osweiler. Whatever team has him can opt out of the deal after 2017 with a hit of $3.2 million in dead money on the salary cap. The Browns could have a difficult time finding a taker. A team would have to have enough salary cap space, a need at cornerback and the belief Haden is still a No. 1 cornerback. In addition to dumping his contract, the Browns would likely look for a receiver or draft pick in return. The Indianapolis Colts are a logical option as a trade partner. Two-time Pro Bowl corner Vontae Davis is out weeks with a groin injury, and Browns vice president of player personnel Andrew Berry and senior personnel executive Ryan Grigson came from the Colts. Haden added about 8 pounds of muscle in the offseason and said recently he feels healthy. He missed 11 games in 2015, including 10 with a pair of concussions, and was slowed last year by a pair of torn groin muscles that required surgery after the season. Haden looked like his normal self as the reports swirled around him. He danced during stretching. He barked during the pre-practice huddle. He lined up with the starters during defensive drills. Kirksey and Haden have been teammates since 2014, and Kirksey wants that to continue. “First off, Joe is a tremendous player. He’s been to multiple Pro Bowls,” he said. “He’s a great person, a great friend and I’d love for him to be a teammate of mine. A trade would leave the Browns thin at cornerback behind the top three. Darius Hillary and Marcus Burley are listed as third-teamers on the depth chart. Burley has one start in three years in the league and Hillary hasn’t played in a game. Other options are Trey Caldwell, a fifth-round pick in 2016, and undrafted rookies Najee Murray, Alvin Hill and Channing Stribling.